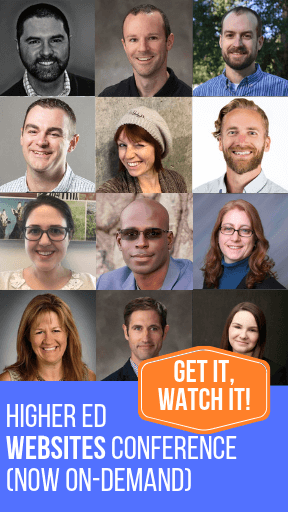 I first heard about RIT’s Surprise Care Package social media campaign from Gretchen Burruto, Associate Director for Web and Social Media at the Rochester Institute of Technology’s Office of Career Services and Cooperative Education. This fun campaign is a great example of how higher ed career services can engage current students and raise awareness about what they do. 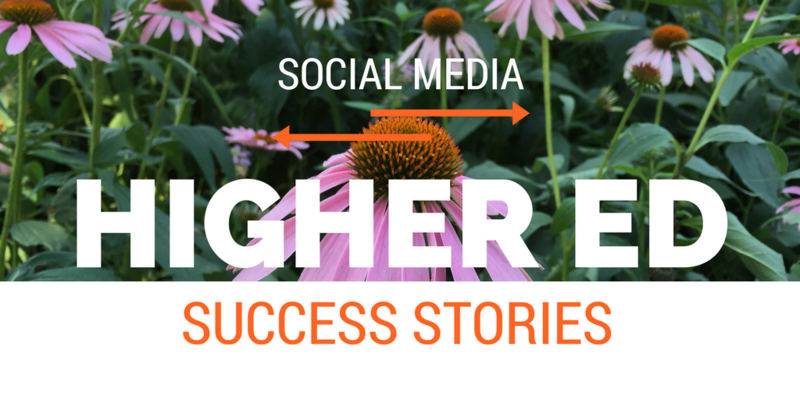 Gretchen’s post is the 5th in my series focusing on higher ed social media success stories written by professionals working in schools (Got one? Email me at karine@higheredexperts.com). What do students want when they are away from home? A piece of home thoughtfully packaged up in a box! 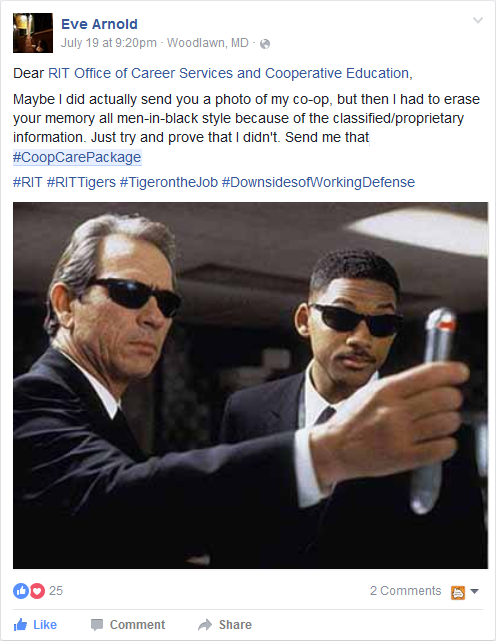 So, RIT Career Services decided to give this all-time favorite a spin for a fun social media campaign. 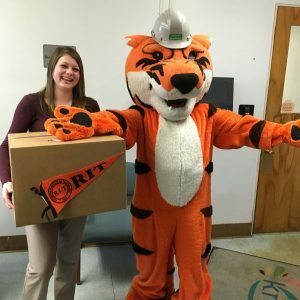 Using RIT’s beloved mascot (RITchie the Tiger), a sense of humor, and an element of competition — this campaign was designed to keep students working on a co-op or internship, engaged with their university. The main goal was to connect with these students during the semesters they worked away from campus. Centered around a friendly contest with fun prizes to win, the campaign ran on Twitter, Instagram and Facebook. It took place twice: November 2016 and again in July of 2017. We miss our students who are out on co-op getting valuable experience! We want to send you a Co-op Care Package, loaded with great RIT swag to enjoy while you are away from “home”! We also invited them to showcase their work environment, their company logo and a little piece of RIT branding in their visuals to increase their odds of winning. The contest rules strongly suggested that students inform their manager– thus raising awareness at the company about the fun campaign. Showing, caring, sharing and winning! We received 15 submissions the first time and 23 the second time. Each time 10 winners were chosen. 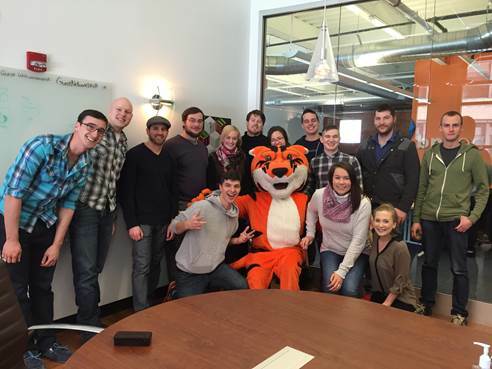 The first one targeted Rochester area co-op students only – and packages were personally delivered by our mascot, RITchie. The fact that it was delivered by RITchie was a total surprise to the student (but we did inform the company ahead of time!). The second campaign, run over the summer, was nationwide and we mailed the packages. The care packages included a RIT T-shirt, pennant, snacks, various RIT branded pens, keychain, and a personally autographed framed photo of RITchie. The second iteration of the campaign reached more than 9,500 on Facebook with a total of 11,060 impressions. Engagement for the page went up 33%. But, beyond increasing reach and engagement, this campaign hit its primary goal which was exemplified by this student’s comment when she received her package: “Thanks again, I am so excited. I’ve been enjoying my summer but definitely missing RIT. It will be great to have a little piece of my second home!”. Another positive outcome was increased alumni engagement at the companies where our mascot delivered the co-op care packages. We brought additional small giveaways for the alumni – but the real excitement for our alumni at these locations was getting their photo taken with RITchie. This campaign also gave us an opportunity to connect with the companies and their social media teams. A few built an event around the delivery. Wegmans organized a breakfast and invited all their 20+ co-op students. Paychex invited their alumni to join their group of co-op students and hosted a pizza party. The CEO from Brand Networks, whose employees are predominantly RIT alumni, played a mean game of foosball with RITchie. All these events culminated in group photos that were shared on social media by us, and the companies, for increased reach and engagement. We are already planning another campaign in 2018. We would like to broaden the campus involvement (ie. : University News and the bookstore) around this fun campaign and tweak the rules for submission. We plan to tighten up the rules to avoid depending too much on the campaign hashtag to identify submissions. Asking participating students to tag us when they post their entry or by posting it as a comment will make it easier to find all submissions. We may also add terms that all entrants grant us permission to use their social media posts and images on our social media and/or website. It will be more efficient to ask for this up front. The biggest take-away is that the best campaigns work on multiple levels. This one was not only tied to student engagement, but it also drew in our alumni and employer partners. It also was a great way to highlight our co-op program. Injecting a sense of fun, school spirit, competition and humor made it work. It was a really positive experience for the team running the campaign, too! What’s not to love? Surprise, fun, caring and sharing — all neatly packaged in a social media campaign. 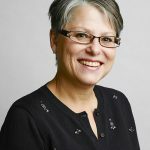 Gretchen Burruto is the Associate Director for Web and Social Media at Rochester Institute of Technology’s Office of Career Services and Cooperative Education. She has worked in career services for nearly 30 years assisting students and alumni obtain meaningful work and reach their career goals. Part of her responsibilities in the Office of Career Services include leading a social media team of colleagues and students. Additionally, she is responsible for the office web site, communications, teaching, coordinating events and implementing technologies. Gretchen has co-presented at national conferences such the NACE (National Association of Colleges and Employers) annual conference and the CSM Symposium.